Hello Linux Geeksters. As you may know, Ubuntu 14.10 Utopic Unicorn Alpha 1 has been released a while ago, coming in the traditional flavors: Ubuntu 14.10 (using Unity), Ubuntu GNOME 14.10, Kubuntu 14.10, Lubuntu 14.10, Ubuntu Kylin 14.10 and Ubuntu Cloud 14.10. Ubuntu 14.10 Alpha 1 uses Kernel 3.15.0.6, but a version of Kernel 3.16 will be used by default on the final version of Ubuntu 14.10. Also, it comes with Firefox 30, LibreOffice 4.2.4, X.org 1.15.1, Mesa 10.2.1, Cups 1.7.3, glibc 2.19 and openssl 1.0.1. 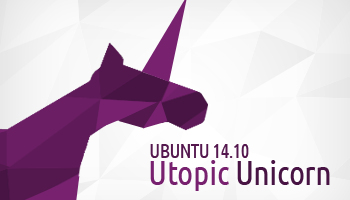 As a reminder, the final version of Ubuntu 14.10 Utopic Unicorn will be released on the 23rd of October, 2014. Ubuntu 14.10 Alpha 1 using Unity still uses Unity 7, running on X.org, but the developers intend to release the final version of Ubuntu 14.10 in two flavors: an Ubuntu 14.10 system using Unity 7 and X.org and another Ubuntu 14.10 flavor powered by Unity 8 and Mir. Ubuntu GNOME 14.10 Alpha 1 uses GNOME 3.12 and the system will stick with it on the final version of the system, despite the fact that GNOME 3.14 will be released in September, this year. Lubuntu 14.10 Alpha 1 using LXDE comes only with some fixes for the already known bugs, no important changes have been implemented. Also worth mentioning, the Lubuntu developers have started porting LXDE, from GTK+2 to Qt, the new project being named LXQt. Ubuntu Kylin 14.10 Alpha 1 comes with a few updates also. Worth mentioning changes: Kuaipan 2.0 client (a storage service similar to Ubuntu One, developed by KingSoft) has been added by default and comes with a new feature helping users to migrate from Ubuntu One, Ubuntu Kylin Software Center has received updates while the China Weather App got some enhancements. Ubuntu Cloud 14.10 Alpha 1 has been also released, enabling the users to test Utopic Unicorn on OpenStack, AWK and other Cloud platforms.